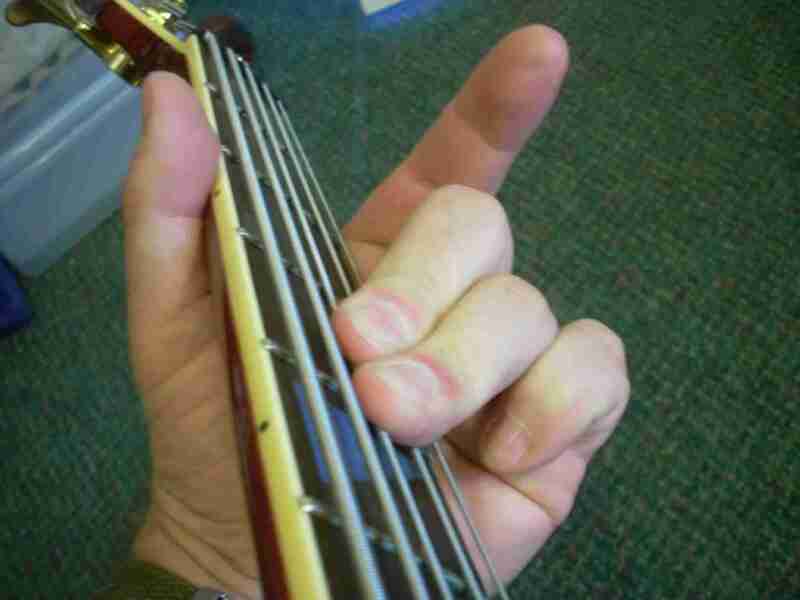 One of the more basic issues to good bass playing and getting a good bass sound, is how one holds the bass. Proper holding of the bass will maximize your ability to move quickly, and play fast if needed. 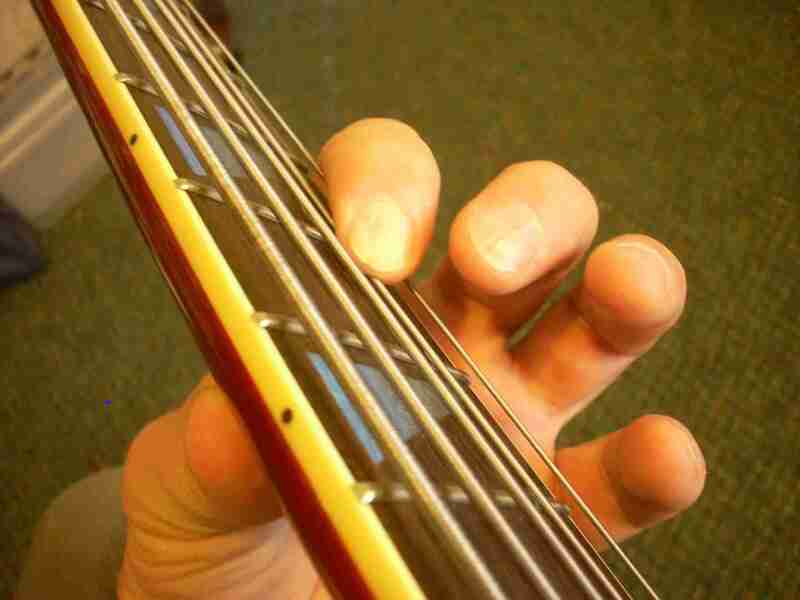 Proper positioning of the left hand and right hand on the bass will allow proper muting of the strings, while playing the bass. Also check out tuning the bass, since it is a basic issue too. After playing the bass for several years, I forget that not everyone knows where the notes are on the bass. This is called "familiarity with the instrument". You should know immediately where the F#'s are on the bass. You should know that the 5th fret on the D string is G. If you do not have a rapid cognitive reflex about the locations, which means that you do not have to spend time trying to figure out which note any particular place is on the finger board, then I would recommend copying my string note charts, by hand, and also printing it out. See the bass finger board layout page. When holding the bass, the vertical position of the bass to your frame is another important consideration. This is adjusted by strap length. If the bass is too low, or to high it will strain your arm muscles and impede your mobility on the fingerboard especially. You should look at some of the instructional videos linked here (not ready yet), to make sure that you are holding the instrument correctly, and that you understand the importance of left hand and right hand placement and how it affects your playing. Many of these issues are not necessarily instinctive. In fact, some of the them will not be obvious at all. Also, with each method of right hand playing, such as using fingers, picks, slapping and popping, double sided thumb technique, and palm muting, come particular issues which must be mastered. Below are some photos of proper left-hand positions for the neck. Notice, that the thumb is across from the first and second fingers. 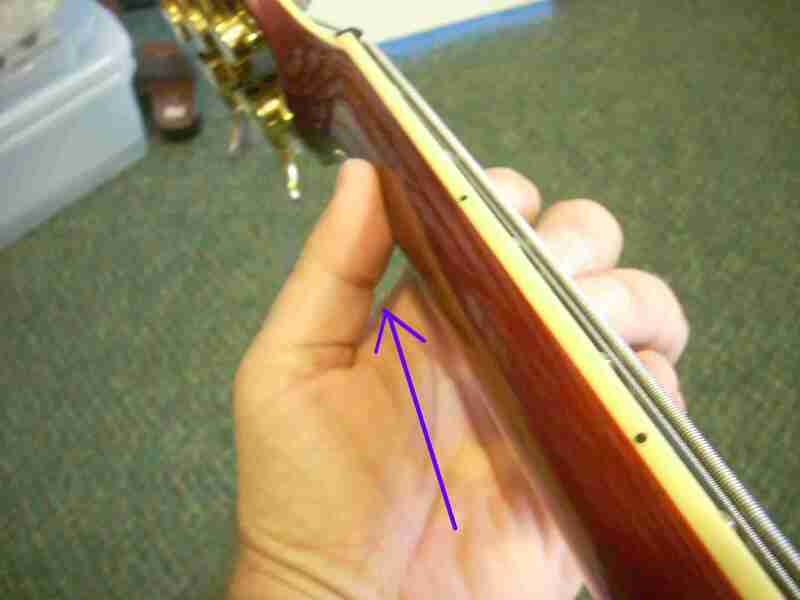 Also, the first finger is right behind the fret, so that you will not get any fret buzz. The remaining fingers are close to the finger board. These could be a little bit closer. A common mistake is to lift the fingers behind the ones that are down. For example, if you have the fourth finger down, you should 1, 2, and 3 down also. This is because, you will likely need these notes soon, and lifting a finger behind one that is down is a wasted move, and unnecessary too. Now below, every thing is the same, except the finger down is not up on the fret. This will result in fret buzz when the note is played. Another important issue on the left hand is having a gap between your hand and the neck. A lot of bass players, including pros, choke the neck when playing the bass. This will slow you down, reduce your hand strength on the finger board, and encourage you to lay your fingers flat, instead of on the tips. Here are some photos of the gap between the left hand and neck of the bass. Below is an example of choking the neck. The fingers (2 & 3) are also bent backwards on the neck, and are laying flat on the finger board. The 4th finger is curled back, so that it is not ready to be used, and 1st finger is away from the finger board, a wasted motion, and not ready to be used soon. Remember, good left hand posture insures easy mobility on the finger board, and the fastest response possible for your hand. Keep your fingers close to the finger board, so that you are not wasting hand motion, and do not choke the neck. Bad habits are hard to break, and these are some of the most common ones. Now, regarding the bent fingers in the above photo. This is a common mistake for beginners and even some veterans. Your fingers should never be bent backwards, as the 2nd and 3rd fingers are above. 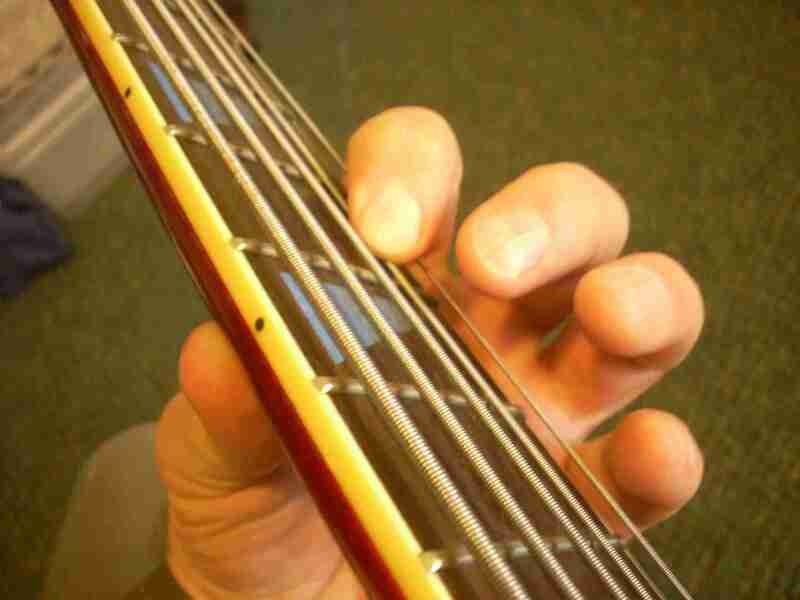 You should always play on the tips of your fingers, except when bridging across to the next higher string (this is a common occurrence, since there may not be enough time to move the finger). Example, you are playing a G on the D string (5th fret) with your 4th finger, and the next note you need to play is a C on the G string (5th fret). 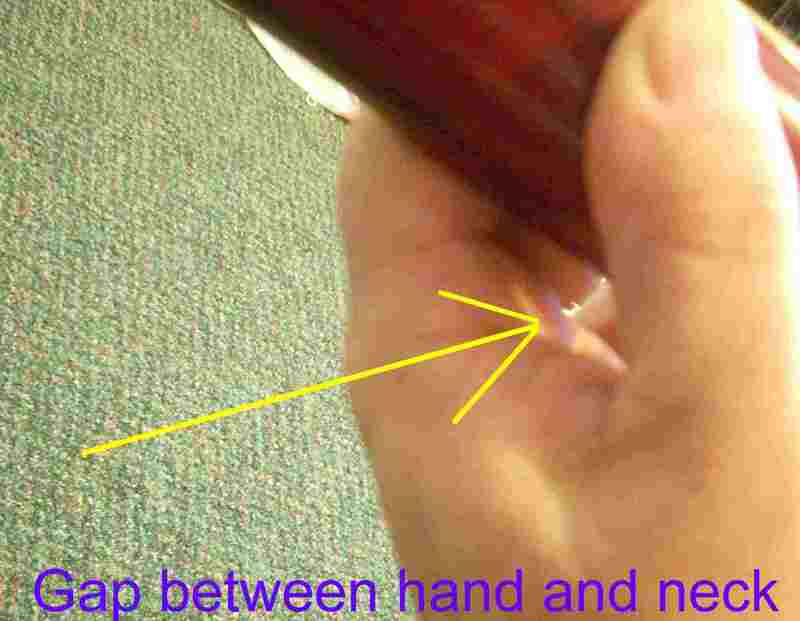 It is acceptable to flatten your finger to catch this note, but the next different note you play should be on the tips of your fingers again. 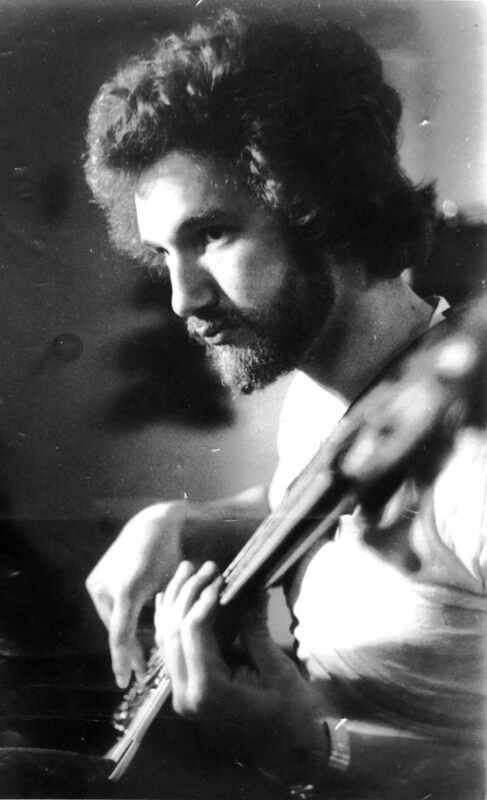 Now for a final photo, this one is from 1979, and it shows me playing the Rickenbacker 4001 model. Please note the hand position of left hand (relaxed and a gap between the neck and thumb area) and right hand (finger style playing) with the fingers slightly curved and playing on the tips above the pickups.